Finding an iron that is worth the pounds can be a hard task. You can spend big bucks and be disappointed or spend less than expected and be pleasantly surprised. 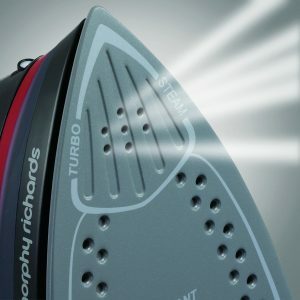 With so many personal clothing irons out there to choose from, where do you start? 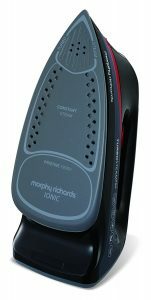 The Morphy Richards 303105 Turbo Steam Pro Ionic Iron is packed full of features. With its whopping 3100W power, it is one of the heavy hitters in the iron ring. This amount of power makes for fast heat up which saves you time when doing the mundane chore of ironing. 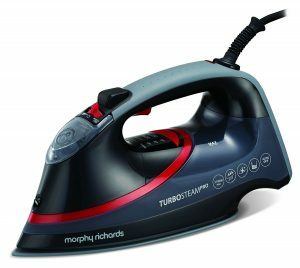 Supplied with a large 400mL water tank, the 1.5Kg Morphy Richards 303105 iron is a little on the heavy side when fully packed with water. But that extra weight seems to work in favor of this iron. It seems to glide over any fabric with ease and having such a large water tank helps in eliminating continuously having to stop and refuel for steaming and pressing. However, the water tank is more on the opaque side and it is hard to see where the lines are so you don’t overfill. The Ionic sole plate on the Morphy Richards 303105 is well built. With its tri-zone technology, there is an area for turbo steam, pressing and drying. The Pressing Plate helps remove excess water and the rolled edge on the sole plate itself, reduces snagging and tearing. A precision tip allows for easy access to hard to iron areas like around buttons, pleats and collars. 55g of constant steam relaxes the fibres in your clothes, while the 200g Turbo Steam Shot removes even the most stalwart wrinkles and creases. There is also a very convenient vertical steam function that allows you to iron curtains, and items that are on hangers. The 303105 has electronic temperature setting buttons which takes the chance of bumping a dial with your hand out of the equation. There are 4 precision settings that match the tags on your garments, so you will know exactly what temperature to iron each article with. The settings are illuminated as well and have a built in heat up feature and beep so you know when the iron is ready to use. When you are all done ironing, the 303105 has an automatic shut off feature to give you piece of mind. The Limescale management system is two fold. Firstly, it flushes the tank to get rid of lime and calcium buildup, and secondly a pouch within the iron itself filters the water. This is something I haven’t seen on any other iron and it sounds like a great addition to have that hassle free maintenance we all want in a small appliance. Like any iron, the manufacturer does suggest using distilled or ionic water for the best results. Completing the 303105 Turbo Steam’s list of features is the anti drip component and the soft grip handle. The later of the two is rather impressive since it is very comfortable in hand. As for the anti drip, all irons say they’ve got this and I still haven’t found one that doesn’t drip a little here and there. With a 3 year manufacturers warranty and the price point on the Morphy Richards 303105 Turbo Steam Pro Ionic Iron, you will find yourself hard pressed to find anything to really complain about. It is built on the sturdy side and glides over fabrics easily. The illuminated controls and 3m cord make for easy ironing. This might be the perfect iron for you regardless of your needs.